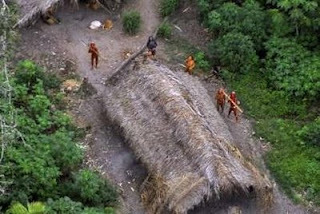 I'm sure by now that you've seen the photos of the "uncontacted people" in the Amazon. 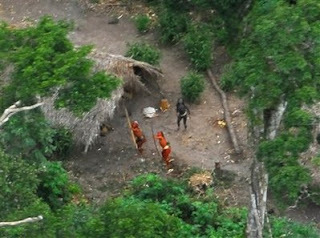 I find if fascinating that the news is saying there are approximately 100 tribes of people who are "uncontacted." This means that in this day and age, these people truly live off the land and are unaware of any technology other than what they have conceived of themselves. One of the articles mentions that these photos were taken on a second flyover, which was about an hour after the initial spotting. The men in the first photo are wielding their weapons at the airplane. I wonder if this is the first time they've ever seen an airplane. What is going on in their minds. Obviously, they are wary of something or someone who would do them harm. But are they just being cautious, or have they already decided this flying monstrosity is a threat? And now that the rest of the world knows about these people, what do we do? It seems to me that they may be happy and doing well with their way of life. And it's very cool for the rest of us to catch a glimse and imagine what their day-to-day lifestyle must be like. But is there a responsibility on our part to introduce them to at least some modern technology? I'm not talking about iPhones and Eliptical machines, but things that they could actually incorporate into their lives like wind-up flashlights, textiles that would be appropriate for the weather, that kind of thing. It seems like maybe they should be made aware of what kind of life exists outside of their hidden corner of the world and then let them decide whether they would like to seek out something more.